Budget Campervan - Our Most Popular Campers - Ideal for Backpackers.Sleep inside with Double bed which can sleep 2 people. It's a New Zealand hire car in the day time, and changes to an original New Zealand camper van at night. Setting up the hire campervan is easy and only takes five minutes. 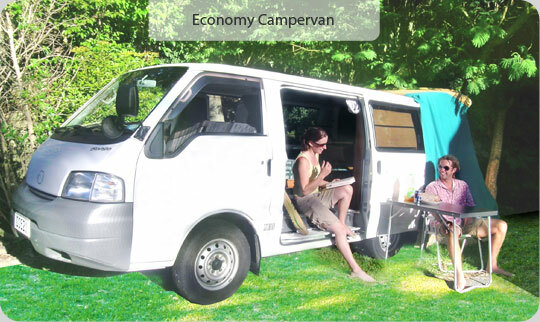 Economy campervan is our most comfortable campervan. Hire a Economy camper van New Zealand which have a day sofa which converts into a double bed or two single beds. 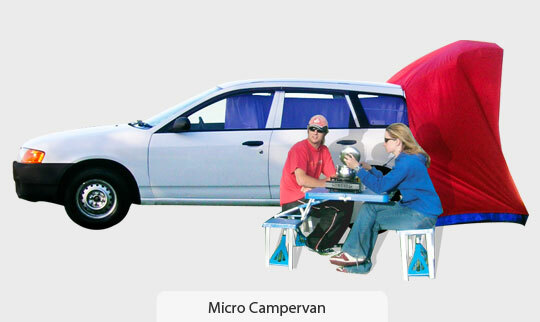 This New Zealand camper van hire includes a fold down table, double gas cooker , kitchen eating/cooking utensils, water bottle, interior lights, 240 volt power supply (if staying in a camping ground), and a tent which fits over the back door The tent provides standing room and shelter from the weather when cooking and privacy when changing clothes. .